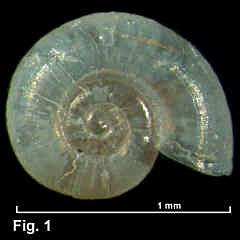 Description: Shell minute, spire flat or slightly sunken. Protoconch smooth, about 1¼ whorls, first ½ whorl sloping downwards. 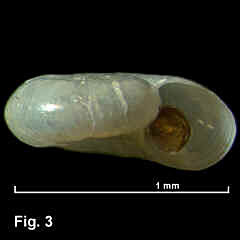 Teleoconch of about 3½ rounded whorls, smooth apart from fine, dense axial growth ridges. Aperture nearly circular, outer lip simple, thin. Umbilicus widely open. 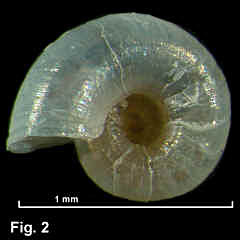 Shell transparent becoming opaque white with age. Size: Up to 1.3 mm diameter. Distribution: Endemic to Australia: Port Stephens, NSW, southwards and around southern Australia, to Shark Bay, WA, including Tasmania. Habitat: Specimens are from intertidal and shallow subtidal rock and algal washings, and from beach washup. Common. Synonymy: Helisalia pallida Laseron, 1954 is a previously recognised synonym. Remarks: The anatomy of this species was described in detail by Ponder (1990). Figs. 1–3: St Helens Point, Tasmania (C.213600). The dried animal is inside the shell, and the operculum is visible in the aperture.